I had planned to post about something completely different today. However, the spinach tart I made did not turn out quite as well as I had hoped. I am going to keep working on it and get back to you. In the meantime, I have this quick and easy dish to give you. It is great for weeknights when you need to get dinner on the table in a hurry. If you buy shrimp that is already peeled and deveined, the prep work goes even faster. I have made this recipe numerous times over the years and have found it to be very flexible. Don’t like tomatoes? Just leave them out. Got a red bell pepper hanging out in your vegetable drawer? Toss it in. Out of green onions? Not a problem. The one thing you don’t want to omit is the lemon juice and the feta. They are the foundation of flavor for this recipe and make the dish really sing. By the way, be sure to check back in on Friday when I bring you a decadent chocolate and caramel cake. Preheat oven to 450 degrees. Coat a large piece of aluminum foil (about 12×12 inches) with cooking spray. Place the foil on a large shallow baking pan or rimmed cookie sheet. Cook the pasta in boiling water 5 minutes; the pasta does not need to be cooked all the way at this point. Drain pasta and place in a large bowl. Stir in olive oil, tomato, green onions, feta, lemon zest, lemon juice, salt, and pepper. Spread the orzo mixture on prepared foil leaving a 3 inch border. Combine shrimp and basil. 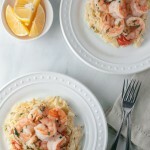 Arrange shrimp mixture in a single layer on top of orzo mixture. Spray another large sheet of aluminum foil with cooking spray and place on top of orzo and shrimp (coated side down). Fold over edges of foil to make a tightly sealed packet. Bake at 450 degrees for 25 minutes or until the shrimp are done. Carefully peel back the foil (contents will be very hot) and divide shrimp and orzo among 4 plates. Squeeze additional lemon juice and drizzle with extra olive oil, if desired.